I read a column on the BBC website before Christmas, by Lucy Kellaway from the Financial Times. She was analysing the behaviour of various commuting cyclists to see what she thought it might tell a potential employer about their suitability. So, for instance, you shouldn’t employ anyone who can do a track stand, because they’re a show-off. Neither should you hire anyone with a nice bike, because they’re just trying to impress you, nor anyone who is a bit unfit and overweight but wears Lycra anyway, because they’re ‘all talk and no trousers’, and so on. I think you are allowed to employ Kellaway herself, but that is about it. There may be some truth in the idea that the way you ride a bike might offer some clues as to how you’d do your job. But my suspicion is that the analysis is a great deal simpler than that applied by Kellaway. It’s time, my friends, to face a brutal reality, and that is that no one who wishes their organisation to thrive should ever employ a cyclist. I can see why someone might make the mistake of thinking a bike rider was just what they needed. There are clear attractions. Cyclists are thin, for example, and would impose minimal strain on cheap office furniture. They are fit and healthy and are capable of tremendous commitment to a team project. However, we need to view these characteristics in context. Cyclists are thin because they are always hungry. No amount of food is enough for them. They will swarm through your office eating all they can find, but it will not be enough. Cyclists do, indeed, have phenomenal powers of endurance. They hone them by riding for miles and miles and miles. They will, for instance, ride the longest possible route to work to pack in some training. They will go on expensive holidays, not to sit idly by a beach, but to go on a training camp. This is all rather splendid, you might think. But remember, after they’ve done all this, they will classify the time they spend at work as ‘recovery’. You know the way your other staff sometimes turn up hung-over on a Monday morning, and achieve nothing all day? With cyclists, you can have a very similar effect for the entire working week. That salary you hand over is only buying that portion of their lives when they drink tea, snooze covertly, and scan online shops for special offers on Dura-Ace chains. The team player thing can cut both ways too. Yes, they might indeed throw themselves into the spirit of your enterprise, and infect those around them with enthusiasm for the cause. Or they might equally start skiving off on sunny afternoons to get a few miles in, and avoid censure by involving their co-workers in a massive cycling conspiracy. The risks for employers are only going to get worse as cycling continues to take over the world. A fat man in Lycra is probably still a model employee. But he will one day become a thin man in Lycra. And the only thing that will decline faster than his body mass index is his productivity. At my parents’ house over Christmas, at the back of a drawer I found an old photo of me with my first bike. I’m not sure I’ve ever seen a picture of it and me since I was about six. It was immediately clear that the bike was about three sizes too small. My knees were round my ears somewhere. I pointed this out to my parents, along with the suggestion that perhaps with the advantages of a timely bike-fit I might have been able to win the Tour 20 years later, and thus been able to buy them better Christmas presents. 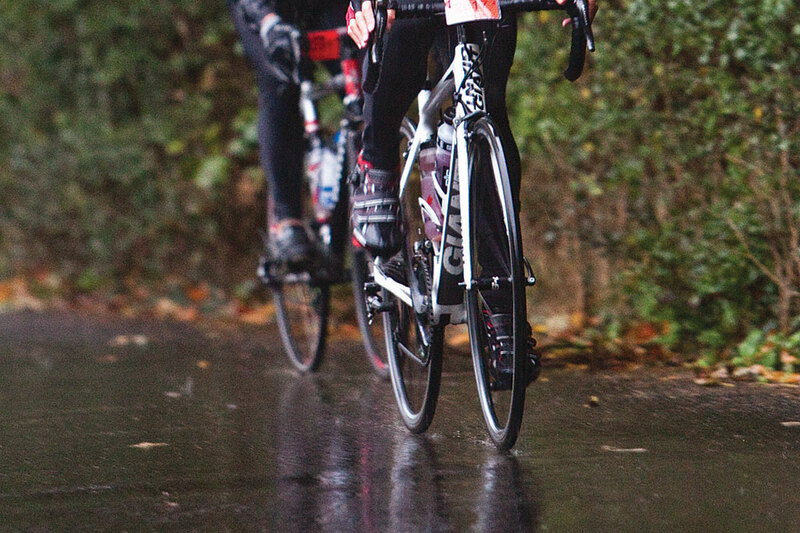 The initial stages of riding in the rain are fairly straightforward. You put on some cycling kit, fetch your bike, and set off much as you would in the dry. You may find that the rain reduces the coefficient of friction between your tyres and the road – but in truth you probably don’t corner that hard in the dry for it to make any real difference. Braking distances will be a little greater. Your feet will be a bit colder. Otherwise, it’s the same. The big changes come when you get home. You must be smug. Before you immerse yourself in a well-deserved bath, you must immerse yourself in self-congratulation. Social media should be engaged at once, so you may criticise other, less committed riders for failing to ‘man up’ and get out there. Post photos of yourself standing in the rain just in case anyone might struggle to imagine what a wet bike rider might look like. Remember to include the line about there being ‘no such thing as bad weather, just the wrong clothes’. If you’re from anywhere in the UK north of Guildford, make sure to point out how hard northerners are when it comes to riding in the rain. Apply yourself to the sofa for several hours in order to luxuriate in your indefatigability. Look forward to the possibilities that might be offered by going for a ride in the snow.